Mr. Jalal, the ILC,with the cooperation of the school's admin and the English Department Staff, has just launched the first round of the "Best Reader" Competition. Which aims to encourage students to read and widen their knowledge through reading and having view on the other cultures' aspects of life and knowledge. MAF School with the supervision of Mr.Fouad Fareed, the Principal and Mr.Jalal Mabrouk, the ILC participated in Madares Al Ghad Best Practices Forum under the auspices of his excellency Mr. Humaid Al Qatami, the minister of education. 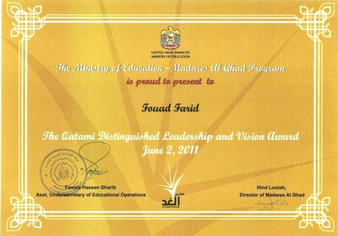 At the end of the forum, Mr.Fouad Fareed has been awarded "The Qatami Distinguished Leadership And Vision Award". Mr. Fouad Fareed, the principal of the school – in the presence of the English Department Team: Jalal Mabrouk, the ILC; Leroy Botha, the TDS; Hassan al-Nagar, English Teacher and Ma’moun Rabab’ah, English Teacher – has kindly honored, handed certificates and prizes for the winners students of the “Spelling Bee” Competition. At the end, the team gave them thanks for the efforts they have made throughout the period of the competition. 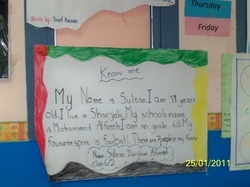 For more information please click to log in to the "School News" page or follow us on Facebook. English Department follows the MAG (Madares Al Ghad) curriculum (CEFR). It consists of the school's ILC,1 TDS and 6 MoE English teachers.